@Brunty CSP: Let’s Break Stuff HTTP RESPONSE HEADER TO HELP REDUCE XSS RISKS WHAT IS A CSP? @Brunty CSP: Let’s Break Stuff IT IS NOT A SILVER BULLET WHAT IS A CSP? @Brunty CSP: Let’s Break Stuff IT IS AN EXTRA LAYER OF SECURITY WHAT IS A CSP? @Brunty CSP: Let’s Break Stuff DECLARES WHAT RESOURCES ARE ALLOWED TO LOAD HOW DOES A CSP WORK? @Brunty CSP: Let’s Break Stuff img-src * ALLOWS ANY URL EXCEPT DATA: BLOB: FILESYSTEM: SCHEMES. @Brunty CSP: Let’s Break Stuff @SCOTT_HELME HE KNOWS HIS STUFF! 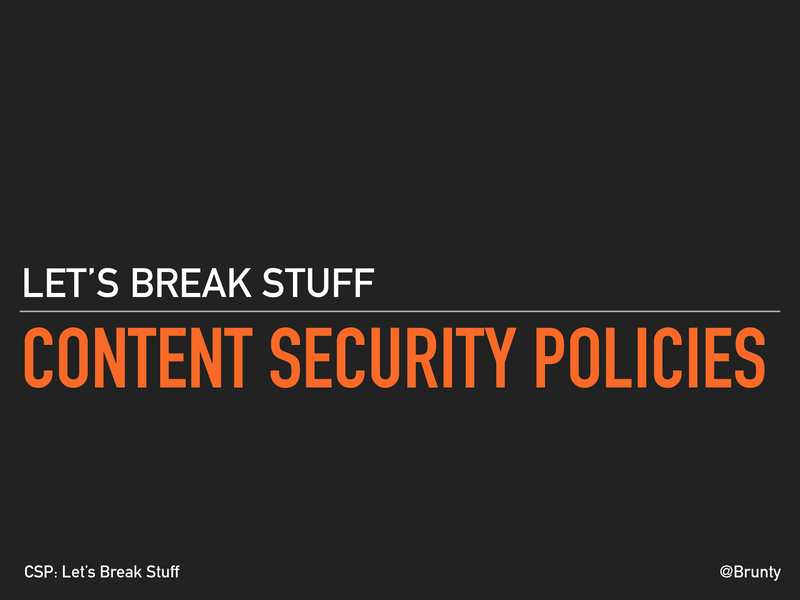 View Content Security Policies: Let's Break Stuff on Notist. Content Security Policies are another tool we should have in our security toolbelt to help protect users of our sites. In this session you’ll learn what they are, why they’re needed, how they work and the limitations on what they can & cannot do to protect users. You’ll see a demo of attacks a CSP will block, you’ll see a site broken by a CSP, show what the different CSP directives & options will do and be introduced to some of the tools available to help with implementing a CSP on your sites! The website that's used to demonstrate CSP directives and implementation.